In a follow up to my last post on the subject, that was driven by my friends from Performance Trust, I was asked in the comments section of that post if there was a correlation between non-interest bearing checking accounts and price-to-tangible book multiples. That nugget was asked by Mike Higgins, a bank consultant from Kansas City, who penned a guest post on these pages in the past. Rather than answer Mike in the comments, I opted for the wider audience distribution of a standalone post. It's my blog. I can do what I want. I am somewhat limited to how financial institutions report their deposit mix. Call report categories are easiest, and the closest metric is transaction accounts to total deposits. I thought this would give us what we needed. So, is their a correlation between a bank's relative level of transaction accounts to their price-to-tangible book trading multiple? The data, courtesy of S&P Global Market Intelligence, is all publicly traded US banks with trading volumes greater than 1,000 shares per day, and that have non-performing assets to total assets less than 2%. That filtered out most of the very small, inefficiently traded financial institutions, and those with asset quality issues. I also eliminated banks that had NA in the transaction accounts/total deposits ratio. The filters resulted in 306 financial institutions, which I divvied up into quartiles based on transaction accounts to total deposits. The top quartile, with 56.78% transaction accounts to total deposits traded at 208% price to tangible book at market close on October 4, 2018. The bottom quartile, with 24.71% transaction accounts to total deposits, traded at 145% price to tangible book. The line is linear. Which reads funny as I proofread. 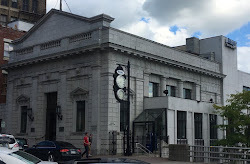 So I would say: yes, community bank investors reward banks funded with a higher proportion of checking accounts with greater trading multiples. 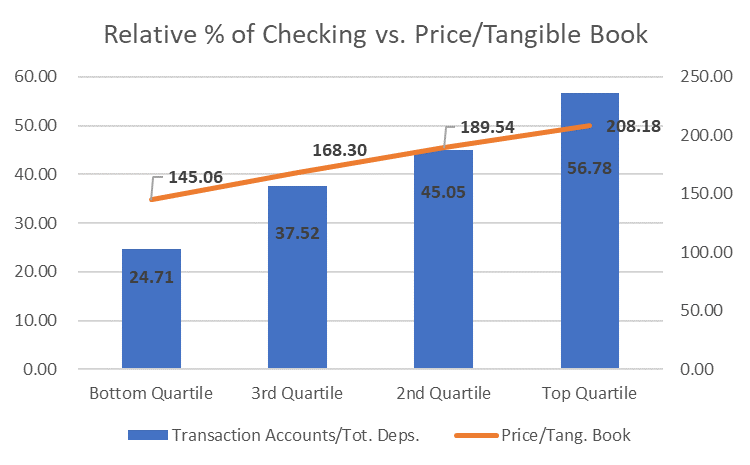 So when I wrote in June 2018, in a post titled Branch Talk, my Point 1 was that banks needed to build a cost of funds advantage by having a relatively higher proportion of checking accounts, the above chart is why. In reviewing the data that fed the above chart, size was likely not a significant issue. All of the numbers above are medians, not averages. And the median asset size from bottom quartile to top were: $1.6B, $2.2B, $3.2B, $2.1B. Wells Fargo and JPMorgan, the nation's largest FIs, were both in the 3rd quartile. So there is a neat line in Return on Average Assets too. Price to earnings is not so neat, but I find it rarely is. Still, the message is clear. More checking, better performance, higher trading multiples. Great post, I have been preaching this for many years to our bankers. I wish I wrote this in 2011 or 2012, when bank CFO's were not interested in growing core deposits because there wasn't enough loan demand for quick deployment. There is never a bad time to get core deposits. Never!